What is summer fun without songs??!! I love sing-a-longs and most kids do, too. Here are a few from youtube.com that I use with my kids. 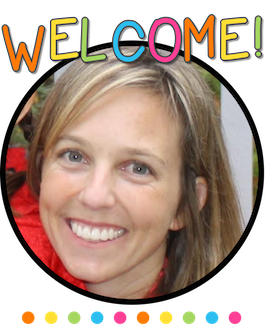 Hopefully, your kids will love them, too!! Both songs are by Laurie Berkner. I love her stuff! She is upbeat, wacky, and just plain fun! In the first song kids will be up and dancing around like fish, with a twist! They will be sleeping, swimming, taking showers, brushing teeth, and being silly fish! The second song is just a fun Monster Boogie. Kids can get down, shake their wiggles out, and giggle! Both songs can be found on the CD, “The Best of The Laurie Berkner Band”. Any of you who have been following me, for a period of time, know that I am a firm believer in active learning. I try to add some aspect of kinesthetic learning to every game that I develop. Most students that I have had the pleasure of working with in my years as a teacher, need movement to help them process the learning. I have worked in both special education and regular education settings. It has been my experience that ALL children benefit from kinesthetic learning. It is enjoyable and adds an aspect of “play” to their learning. Here is a short video from The Teaching Channel that emphasizes how essential kinesthetic learning is to some children. Speaking of movement and kinesthetic learning, you can see the children jumping in their chairs. They know summer is right around the corner! Students sense that change is coming and with it the freedom that comes with summer days. Summer is associated with playing and fun. I truly believe that you can recapture your students attention, if you change the presentation of your information into the form of games. Some friends and I have teamed up with Educents for an amazing bundle of instant downloads for you! Click here to see the bundle on Educents! I have two fun packets in this bundle! The first one is called, “Fill Up My Bucket!”. It is a set of math centers with hands-on fun! Fill the Buckets! Numbers 1-5. This is a center for counting and recognizing numerals. 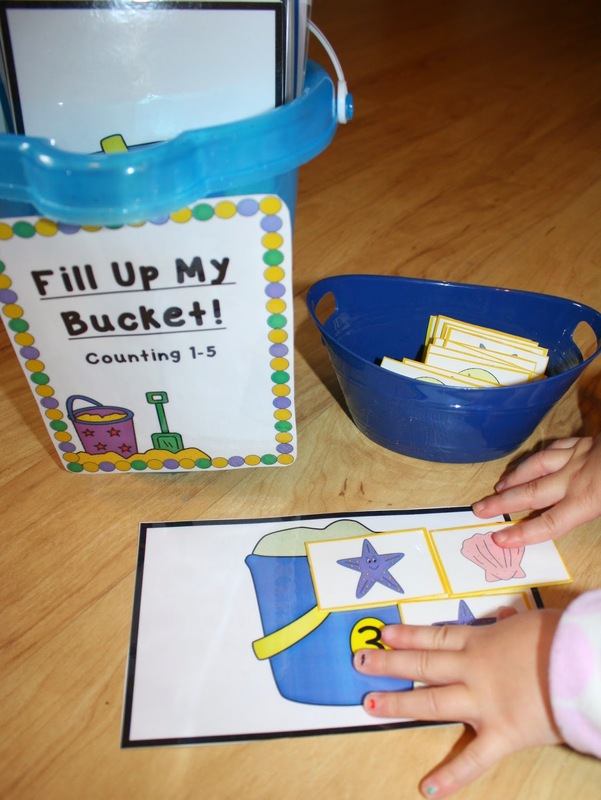 Students will recognize the numeral on the bucket and count out the correct number of seashell manipulatives. 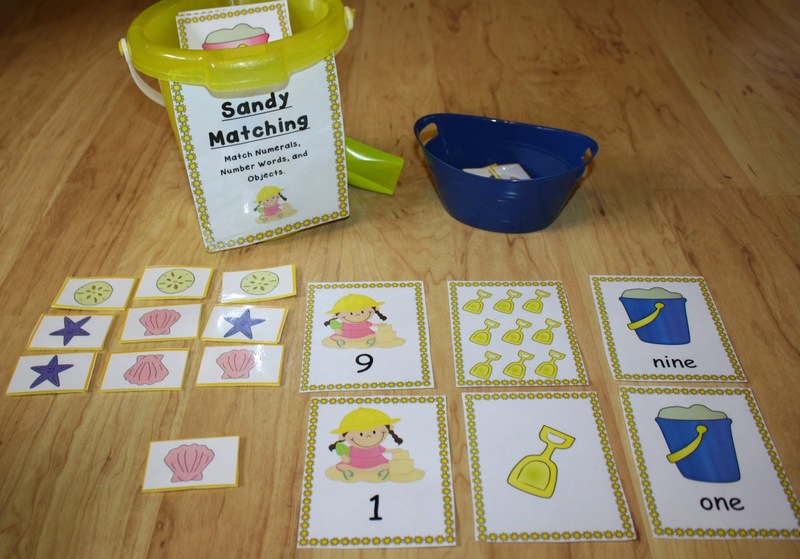 Students will complete an extension activity to count an amount of beach objects and write the correct numeral. If you would like a free copy of the labels that I used on my beach buckets, click here. Fill the Buckets! Numbers 5-10. This is a center for counting and recognizing numerals. 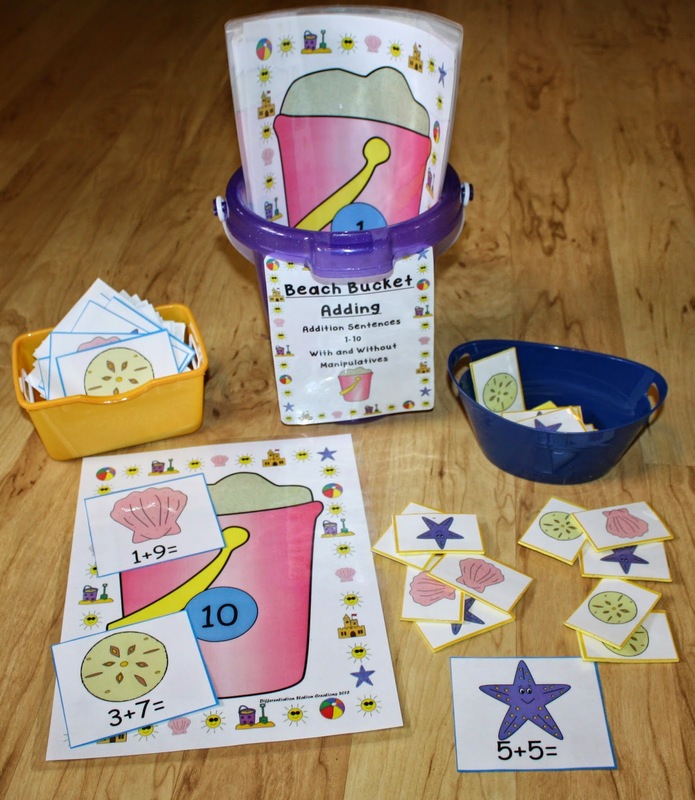 Students will recognize the numeral on the bucket and count out the correct number of seashell manipulatives. 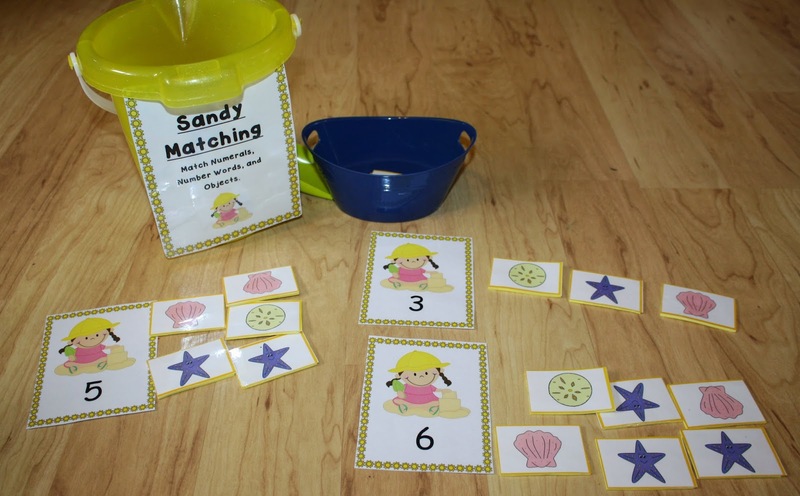 Students will complete an extension activity to count an amount of beach objects and write the correct numeral. I print and laminate the seashell manipulatives. Then, I hot glue foam to the backs of the shells. This makes it easier for students to manipulate the shells. Sandy Matching. 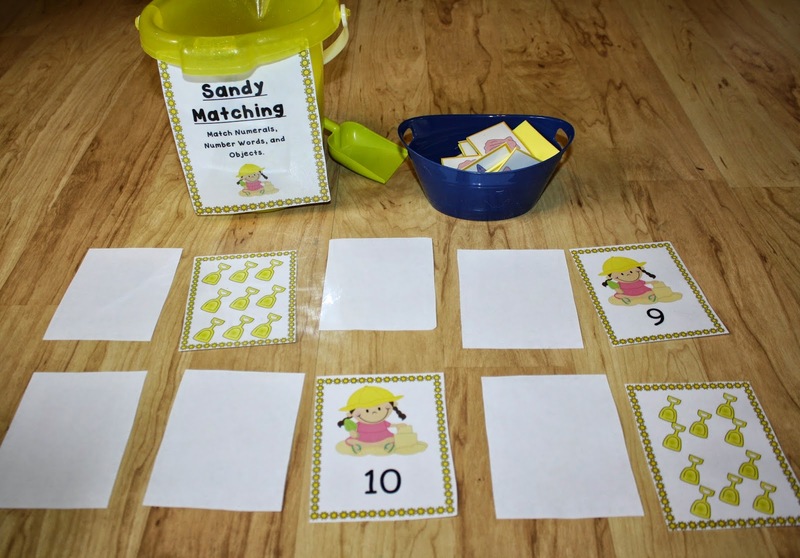 A center for matching numerals, number words, and objects.Students will recognize and identify the number word, numeral, and count the number of objects. Students will match the cards. 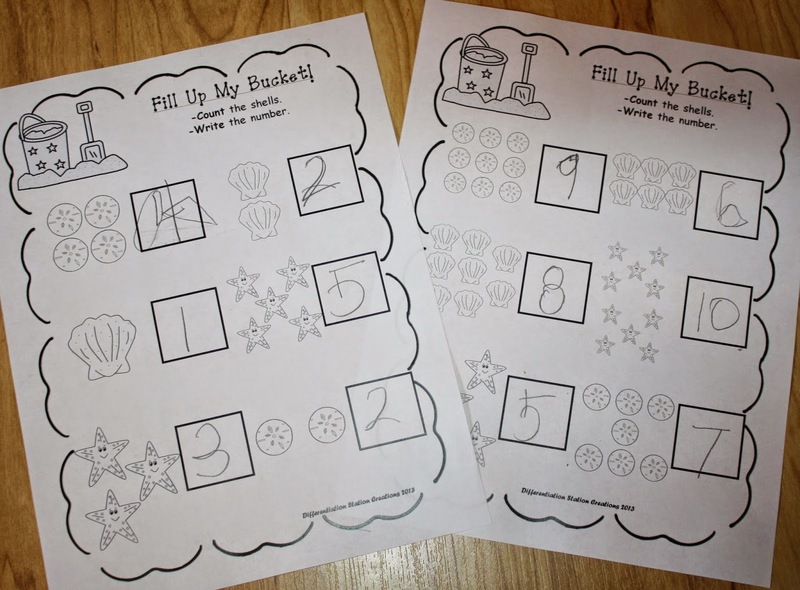 Students will complete extension activities to trace and write numerals and to match a group of objects to the correct numeral. I play these games a number of ways. In one game, I have students choose a numeral card and count out the matching number of seashell manipulatives. You can also play memory with any combination of cards. Below, we used numeral and object cards. Another example of memory! Numerals and number words. Use the cards that will challenge your students. You can print two copies of the same cards, so that students would match the same thing. Another option for the cards is to have students match all three types of cards AND then count out the correct number of manipulatives to match. Beach Bucket Adding. A center for addition, with and without manipulatives. Students will solve equations with sums from 1-10. Students will understand that different combinations of numbers can equal the same sum. Students will record equations on the extension worksheets. Here is an example of how I set up my center. 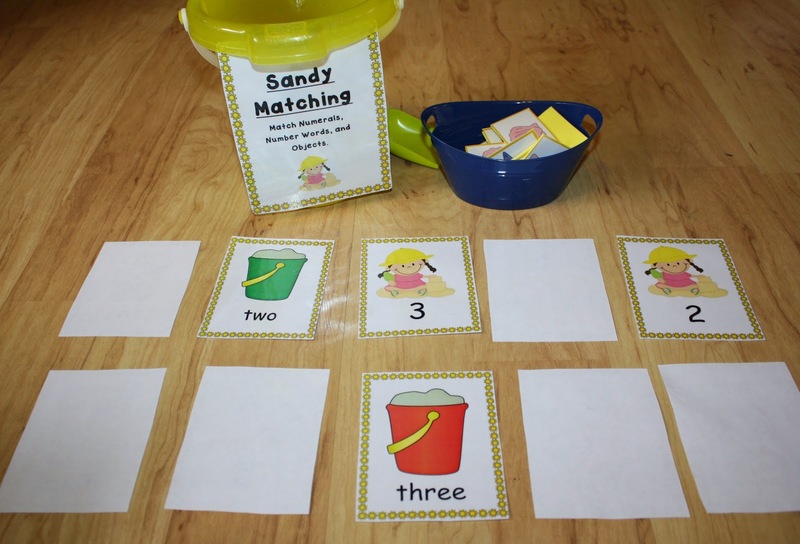 I put all the mats in a beach bucket and added containers for the addition cards and manipulatives. It also shows all the different recording sheets printed in both color & black and white. I would start out with only a few numbers and addition sentences. 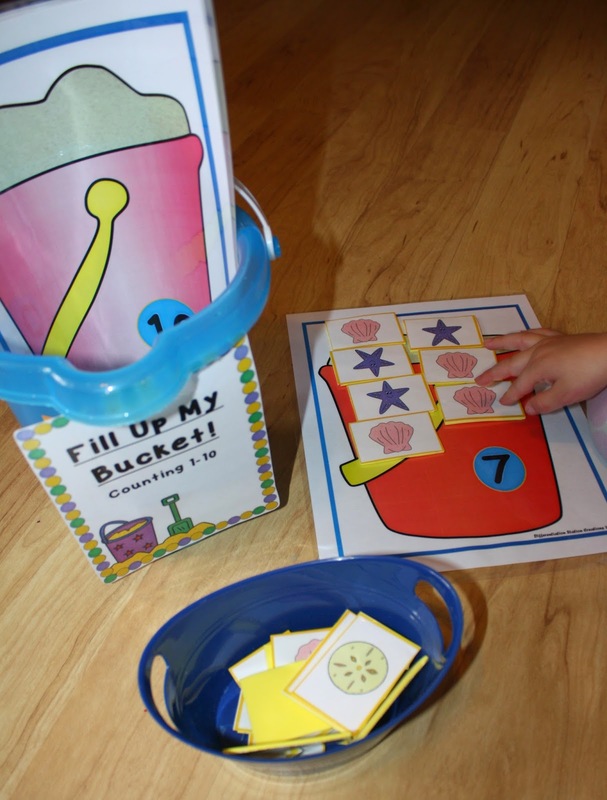 Students will use manipulatives to solve the addition sentences and place them on the correct bucket. You can see an example below. Students will then record the sentences on their recording sheets. Here are all the recording sheets. 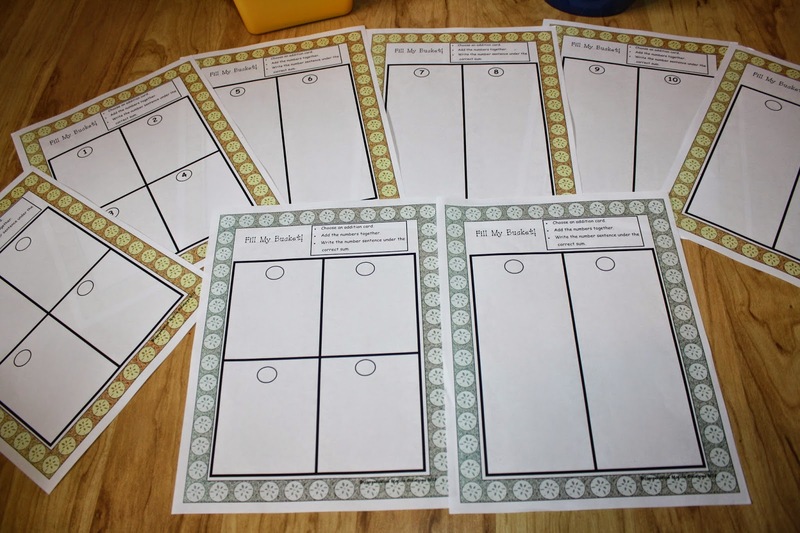 I have included 2 blank recording sheets, so you can work on specific numbers. The second game in this bundle is my absolute favorite! 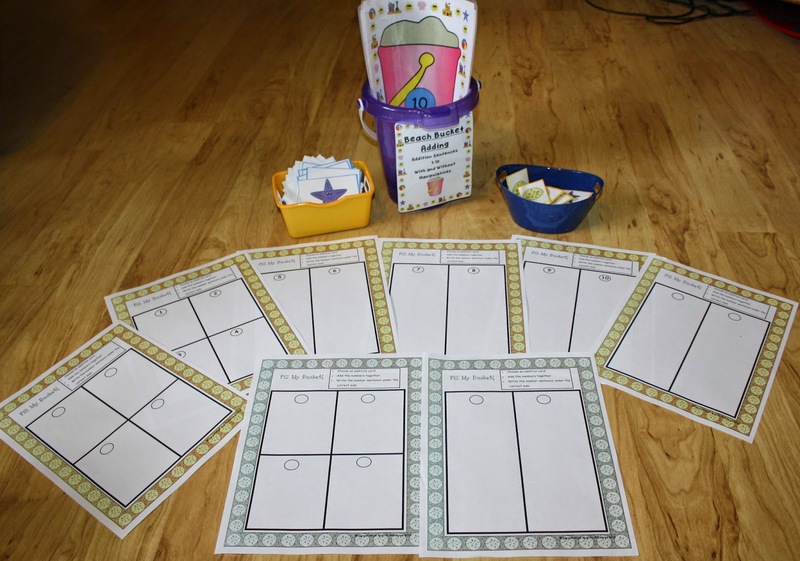 “Monster Munch” is a silly monster themed set of centers, games, printables, and a lesson plan. These games focus on addition to 20, number lines, and missing addends. This product is geared toward kindergarten, 1st, homeschool, and special education instruction. Many of the games focus on active and concrete learning. 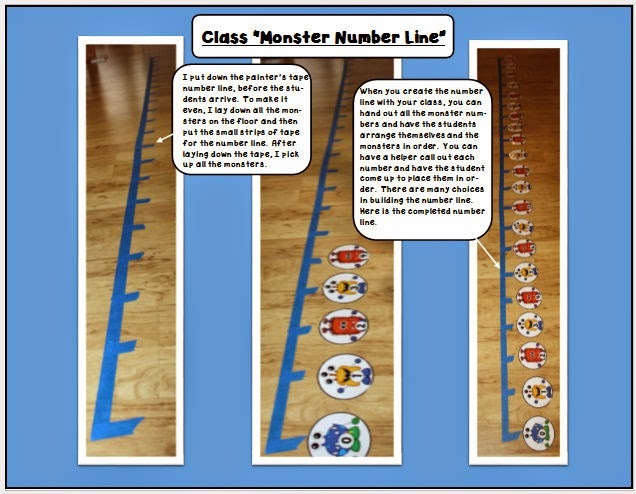 One of my favorite parts of “Monster Munch” is the class number line. 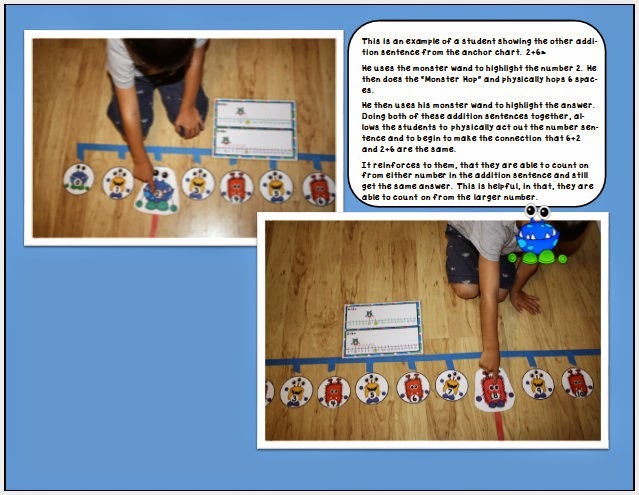 I use painters paint to build the outline of the number line and have students actually build the number line together. It is awesome to watch them problem solve to make the numbers make sense. I included personal number lines in the packet, so students can work at their seats or in pairs. They can also check their work on the class number line. Here students are using anchor charts to demonstrate the commutative property. 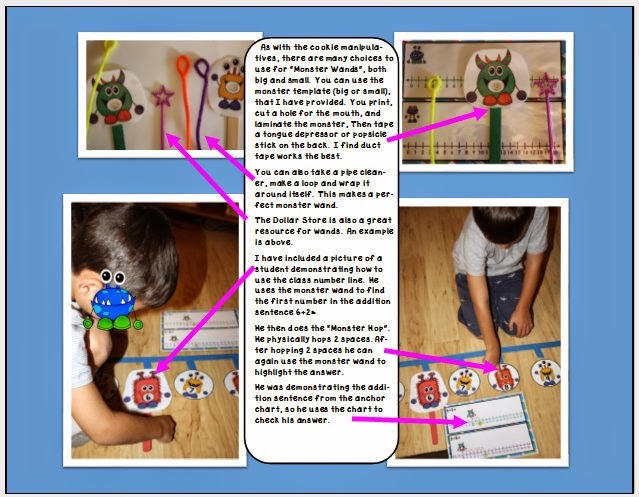 Students are able to act out the number sentences with the monster wands and it helps them to really build a stronger number sense. I have a number of “Roll, Add, & Cover” games. They include: Adding 2 numbers, adding doubles, adding 3 numbers. 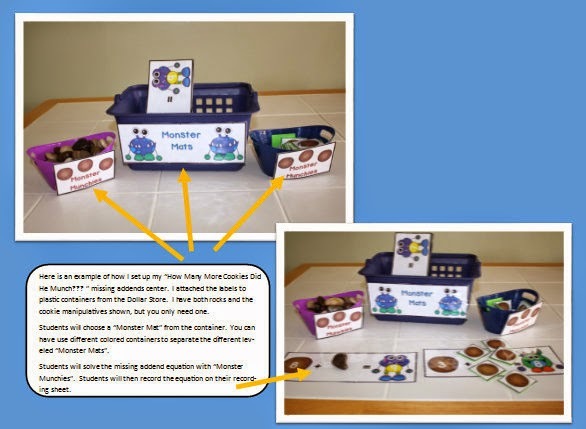 I included labels for the manipulatives and cookie manipulatives that you can print and laminate. I hot glue foam to the back of my manipulatives, because it makes it easier for children to grasp. This is an example of the “Monster Munch” centers. 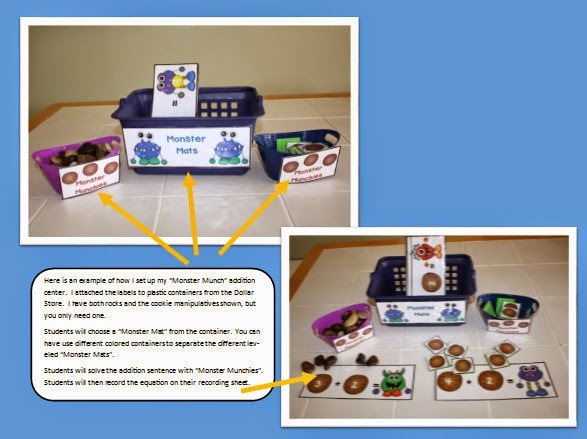 Students will solve addition problems, with or without manipulatives. Sums include: sums to 10, sums to 20, and doubles. Students will record the addition problem in equation form. Labels are included. The “How Many More Cookies Did He Munch?” center focuses on missing addends. Students will solve missing addend problems, with or without manipulatives. The sums include: sums to 10, sums of 10, and sums to 20. Students will record the addition problem in equation form on the recording sheet. For a limited time the bundle is $10.99 from Educents, which is about 75% off! It also includes these other great products so there is sure to things you love! Click here to get the bundle! This post contains affiliate links to Educents. See my full disclosure policy here.